Prince William, Diana and Queen Mother. A young Prince William with his mother, Diana Princess of Wales and The Queen Mother riding in an open carriage on The Mall, during Trooping The Colour in London on June 11th, 1988. Pictured here is one of the many carriages that carry members of the Royal Family from Buckingham Palace to Horse Guards Parade on The Queen's official birthday. 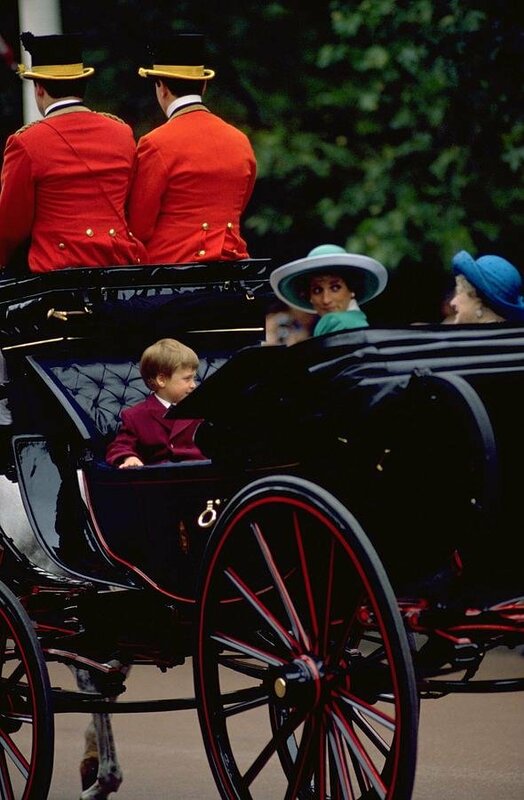 The picture is taken from the rear of the Royal carriage, just as Princess Diana looks over her shoulder. The carriage drivers wear red jackets and black top hats with gold trim.